It's starting to look very festive, everywhere you look, it's because Christmas is just around the corner. No, we are not too early, because people around the world are preparing for the big day, buying their presents and decorating their stocking. It's no surprise then, that they go online to look at the perfect present for their loved ones. That's where you and your brand come in, to remind them of what could be the perfect present idea. We have thought of some exciting ideas to grab attention on social media, so read on! It's the perfect time of the year to try something different. Put all your social marketing efforts together and organize a Facebook Family Photo Competition: have your fans post photos of their Craziest Christmas Tradition! Or, encourage them to share their Favorite Holiday Recipe in an Essay Competition and compete for prizes! Engagement will sky rocket as fans can vote in the application for their favorite entry. Make this a Christmas to remember and encourage your fans to play around with your product. Have them Design the perfect Christmas tree with our Edit Photo/ Item app! Playing around in the application, fans can choose which product from your offer will be wrapped under the tree as a present. Increase customer loyalty and generate new business with next purchase. Are you a fashion brand? Set up a What's your ideal Christmas dress or Which Christmas movie are you Quiz! Fans will love it. Try out an interactive Memory game app and have fans guess all The Christmas villains for a chance to win a prize. Facebook page engagement & brand awareness is what you will get! Remember that Christmas social media campaigns are important to reach new fans, increase engagement and generate holiday sales. Are you interested in running a social media campaign? Our application database enables brands to launch the perfect social media campaign on their Facebook Business Page. Our apps include quizzes, photo/video competitions and contests, editing photo apps, essay competitions and many more. 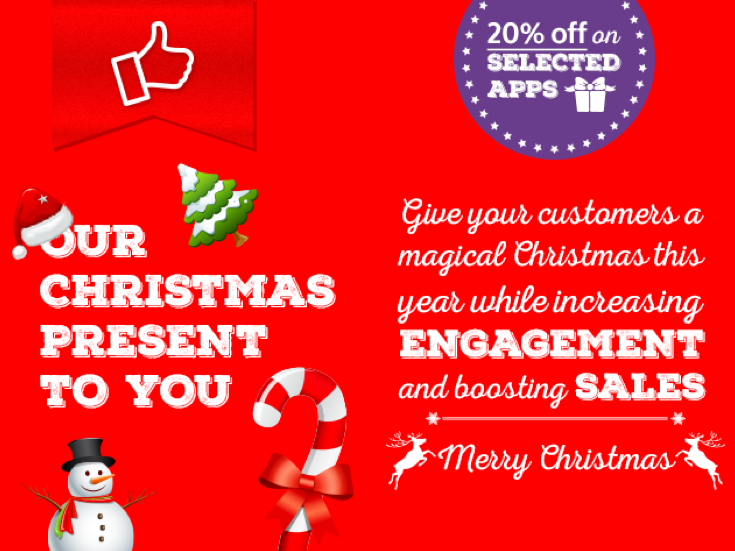 If you would like some help with your Christmas Social Media campaigns, be sure to check out our Special Christmas Holiday Apps Offer, or drop us an email at: info@appssolut.com. If still in doubt, and you need more help with your Christmas Social Media campaigns, drop us an email at: info@appssolut.com.